A special STAGECRAFTER'S Theatre performance of Oklahoma! You will get to see a dress rehearsal performance before the opening night!! Sponsored MLK Day 2018 district initiative with $500 donation to increase visibility. Awarded $54,000 in grants to Royal Oak schools (up to $6,000/school) for proposals that were consistent with the Foundation’s mission of enriching lives through educational opportunity. Criteria for these grants included being consistent with District vision and goals, serving all students, supplementing rather than supplanting school district funding (i.e. enhances what the District normally funds), enhancing the District’s service to the community and meeting an identified need that would not be met absent Foundation funding. Non-capital enhancements were preferred. The grants were approved by District administration and recommended by the ROSF Ad Hoc Grants Committee to the Royal Oak Schools. Sarah Hunton, RO School’s Communication Specialist, has produced a video of the recipients of the grants that were funded. This video will be shown at a ROSF meeting in early 2019 and will be available for ROSF to use as marketing and promotional tool. Watch the video here!! The Jumpstart Instrumental Music Program was funded for the seventh consecutive year with a donation of $7,500. This program provides all fifth grade students an opportunity to try and receive a head start on playing an instrument in Band or Orchestra in 6th grade at Royal Oak Middle School. The program includes a Cultural Arts Presentation for all 5th graders at their school. The Presentation consists of instrument demonstrations and an instrument petting zoo where they can try the instruments. The demonstrations and petting zoo are presented by the staff at McCourt’s Music. The grant not only covers the cost of the staff but also all needed supplies (instruments, 2 reeds per child, sterisol, sanitizers, valve oil, slide oil & swabs). In April and May the students attend 2 afterschool clinics taught by Royal Oak staff. The classes are offered by like instruments providing students a chance for more personal attention as they just get started. The Foundation then assists with the cost of the 4/$45 lesson package offered during the summer months. The lessons provide one on one instruction prepping for Beginning Band or Orchestra in 6h Grade at ROMS. Lessons are taught by professionals on their principal instruments at McCourt’s Music. Dan Champagne Memorial Scholarship provided two $500 scholarships to Royal Oak High School graduating seniors. This was the first year that the scholarships were offered in coordination with the 8 annual PTSA $500 scholarships. The additional ROSF Champagne awards allowed the PTSA selection team to select these additional students who had an emphasis on community service. The recipients of the Dan Champagne scholarships for 2018 were Emily Esbri and Christina Liu. Gary Vanek $500 grant to INTERACT (ROHS alternative spring break) to support students in need in funding this trip. Raised $25,191 from the Foundation’s annual golf outing on June 26th at the Red Run Golf Club, under the leadership of Patrick Wolynski. Raised $1,825 from the 6th Annual Celebrate Royal Oak wine/beer tasting held at the Holiday Market, under the leadership of Anna Longe. Raised $1,431 from the Friends of the Foundation, under the leadership of David Dursum. The ROSF joined the Community Foundation for Southeastern Michigan (CFSEM) in March 2018. The Foundation invested $25,000 in the Community Foundation of Southeast Michigan, which will manage that portion of Foundation endowment monies. The Foundation’s Endowment Committee modified its policies, now titled Royal Oak Schools Foundation Self-Managed Endowment Policies, and presented them to the Foundation Board for input, revision and approval. An information campaign in 2019 will encourage our Royal Oak businesses, Golf Sponsors and the public in the choice and security of participating in our fundraisers, the CFSEM or both. The legacy of the ROSF can be made in perpetuity by donating through the CFSEM as any endowment will continuously contribute, year after year. The Endowment’s long-time financial advisor, Ray Neuman, retired at year end and Ray’s successor is Steve Roque. The Foundation’s self-managed endowment remains invested through LPL Financial. The Foundation Board temporarily transferred $35,000 to the self-managed endowment in 2017 in order to earn a greater return in a challenging investment market; this money was returned to the Treasurer in late 2018 to complete the Board’s current commitment to the Royal Oak School District to fund nearly $53,000 in grants to the District’s nine schools as the major portion of the ROSF’s 2017-19 school grant program. The Royal Oak Foundation met with the Ferndale and Berkley organizations to investigate the potential of all three Foundations working together to promote public education. The discussion included fund raising projects, scholarships, and other means that the Foundations could serve the school district. A decision was made that the three districts combine in a fund raiser in the spring of 2019. 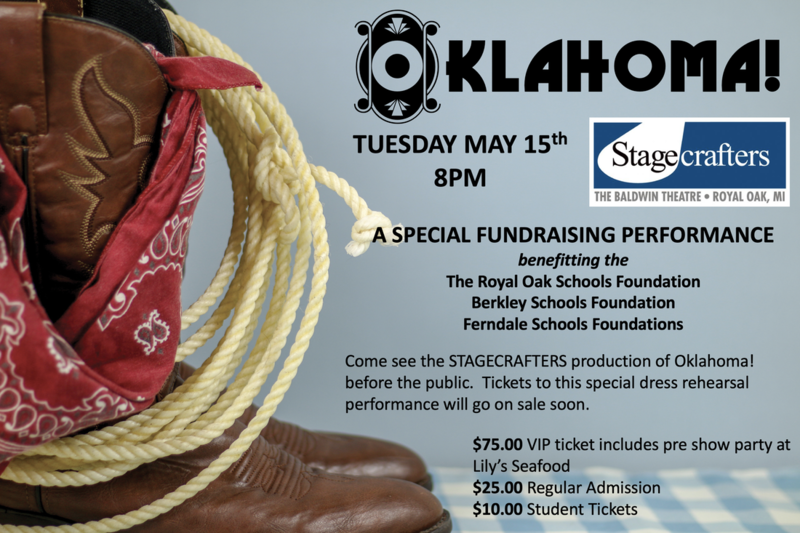 Stagecrafter’s Theatre is offering a one time performance of “Oklahoma” to the Foundations on May 14, 2019. Meeting are planned to finalize the details. The Foundation enlists support from the community-at-large during our Celebrate Royal Oak event in the winter and our annual golf outing in the summer. The Foundation not only donated to, but Board members also volunteered at, the Royal Oak and Berkley district’s MLK Day of Service. ROSF hosted a booth at the RO Holiday Glow event on December 7 and 8. This event was intended to increase awareness and exposure to the Royal Oak community at large on the presence and contributions of ROSF. At our 2019 annual meeting, the Foundation will celebrate its 25th anniversary. In 2018 we donated over $63,000. As of 12/31/18 the Foundation’s assets totaled $396,504 and we had $10,105 in our bank accounts.